Fall is officially here and I make note of that, not because of any specific date we’ve passed, but because cold weather annoys me and I found myself kicking in the heat in our place every evening this week. My thoughts have now turned to using the great big fireplace in our flat, but I am dreading hauling in all the firewood I’ll need to begin to enjoy it again. Don’t get me wrong, I consider us fortunate to have a big old wood-burning fireplace in our living room and I do like to use it, I just don’t like all the prep work involved. I then thought about alternatives, and for those that don’t have the ability to have a conventional fireplace in their home, there are indeed some great alternatives. Aside from gas, which also requires major installation work, an ethanol or alcohol gel fireplace is the easy alternative that can be installed pretty much anywhere. Alcohol gel is a non-toxic gelled alcohol made from organic thickeners and isopropyl alcohol. The gel comes in a can lasting for about two or three hours and burns clean without any fumes or smoke. No flue is required, allowing for the unit to be wall-mounted virtually anywhere in the house. 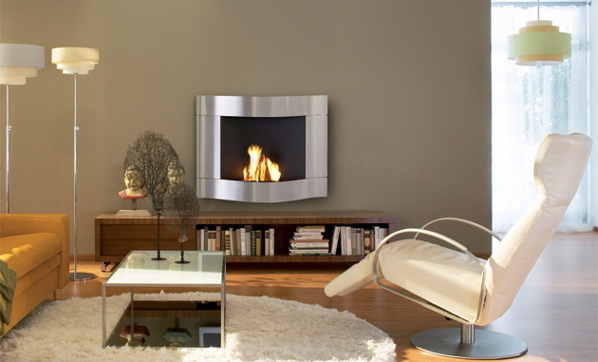 Inflame is a local gel fireplace supplier that offers both traditional and contemporary styles. Ethanol is also a clean-burning fuel and also does not require any flue. With ethanol derived from corn, it is said to be more environmentally friendly than even a wood-burning fireplace. A particular favourite of mine in this category has to be the stainless steel Large Wave model from Blomus, which has a no-nonsense clean look and a large opening. It can be easily installed and retails for about $1,800. Best of all, Blomus is a German company, so you know it’s got to be good because Germans always make good stuff!